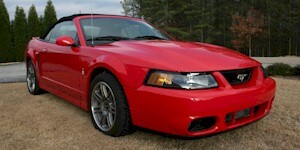 2003 was the 10th year the SVT Cobra was offered. This event was commemorated with the release of the Limited Edition 2003 10th Anniversary SVT Cobra. The limited edition modifications over the normal Cobra included: carbon fiber patterned leather on the top of the steering wheel, carbon fiber leather on the shifter and hand brake, red window switch bezels, red seats inserts, red painted brake calipers all the way around, and big 17x9 inch 10th Anniversary wheels. Black 2003 Mustang Centennial Edition coupe owned by Brent Daggitt from BC Canada. Only 3000 Centennial Editions where produced in 2003. They where all painted black with two-tone parchment interiors. 717 of them were coupes and 1323 were convertibles. They came with the 4.6L 260hp V8 engine from the GT. Brent says, "I bought a truck six months prior. I told dealer that I loved Mustangs. A few months later he phoned said, 'Get in here, I have a Mustang for you.'" Black 2003 Mustang GT 100th Anniversary Special Edition owned by Kyle Wood from Princeton. West Virginia. Ford build 717 of these. They where all black with two-tone tan interiors. Kyle added JLT intake, UPR o/r X-pipe, Bamachips tune with sct tuner, Steeda Tri-ax shifter, and PA performance coils. It has 78,000 miles on the clock. After these photos were taken, Kyle added SSS cat-back exhaust and smoked headlights taillights and fog lights. Black 100th Anniversary (Centennial) 2003 Mustang convertible with a two-tone parchment interior. Ford only made 3000 of these in the coupe and convertible. Like the first Ford cars - you could get this Centennial Mustang in any color so long as it was black. Black 2003 Mustang GT Centennial Edition convertible owned by Megan McAleer from Gaithersburg, Maryland. It has the 4.6-liter V8 engine, four speed automatic transmission, brand new mfg. Good Year tires, brand new 17x8 inch 5-spoke chrome wheels, 4-wheel anti-lock brakes with traction control, dual exhaust, rear spoiler, fog lamps, matching black convertible top, convertible boot, standard Premium Verona-grain Imola leather seating surfaces in two-tone parchment, 100th Anniversary badges embossed on the seats & outer fenders & decklid, leather-wrapped steering wheel, power driver's seat with power lumbar support, and Mach 460 AM/FM Stereo with six-disc CD changer. Megan says, "I've had this convertible for about three years and it's barely been driven. I had helped a boyfriend purchase it, but needless to say the relationship soured and now I'm left with a car that I do not need! The car looks great inside and out and only has a little over 55k miles on it. I would keep it for myself, but am looking for a less-sporty car. You can message or call me for more details."